Where would you rather get sick America or Sub-Saharan Africa? The new health law will help, but it is really only an expansion of the current health system. It's not a new system. Not to be obtuse, but what has Chile to do with sub-Saharan Africa? Sit tight, Obama gonna fix everfing for ya. I suspect that there isn't a single system in the world that is very efficient at health care. It is a bureaucratic nightmare and a monster. I haven't heard anyone touch on the subject of malpractice suits. If we have a national healthcare system, could doctors be sued? The governmental system of health care? Lawyers may not like this too much and may be a powerful "nay-sayer" to that manner of health care. Malpractice is a complex problem. One of the historical reasons for large medical malpractice and punitive damage awards in the US is that we assumed the burden of paying for future medical expenses would be on the person who suffered malpractice. Such a person might not be able to get insurance anymore, for instance, and would have to pay out-of-pocket. So, the malpractice award was meant to offset those types of future costs, deep into the future - for the lifespan of the victim. In a system where healthcare does not depend on your personal level of income, that entire consideration is obviously changed. I think many of these malpractice suits use that as a false justification (although many are valid as well). I think, many sue because they see hospitals/insurance companies as cash cows. If they have to, they will be honest in their claims and just say that they had "emotional or psychological distress" or that they just feel compensation is in order. I really don't think lawyers are going to give up on a big money maker for themselves. There are a number of issues with our health system. One major problem is the way we deliver care to people who have no insurance or very poor insurance. This is done through ER visits rather than primary care physicians. As a result, chronic diseases such as diabetes do not get managed efficiently at an early stage where delivery of care would be cheaper and more effective. Rather, we wait until there is a serious problem and then we try to fix it. This was one issue that Obama tried to resolve (very poorly imho). We also do not have a uniform system. We have insurance, medicaid, medicare, VA, ER visits for the uninsured, etc. etc.. All these different systems lead to bureaucratic complexity and add cost. 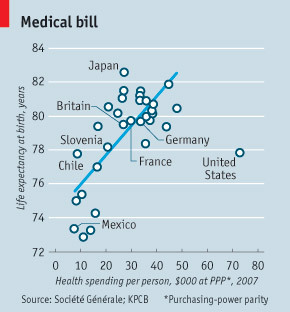 All that said, I don't think that we have a bad health care system. But I do not think it is any better than that found in other developed countries. The problem is that we are paying far too much for what we get in comparison. I really think we need to have a constructive debate (i.e. not the usual partisan bickering) and that should start with a set of principles of what we want from our health care system. I suspect that there isn't a single system in the world that is very efficient at health care. It is a bureaucratic nightmare and a monster. Yeah, but as far as the developed 1st world goes, no healthcare system wastes more on bureaucratic/administrative costs as the US healthcare system. We run the most inefficient and wasteful system out there. It's shameful. American should be the best, not the worst.